Fivestars Ltd have been partners for many years with top German staircase company “Kenngott” who manufacture contemporary wall mounted staircases of the very highest quality. Their adaptable designs can be made with all types of tread materials from “Longlife” laminate, natural and special woods through to granite, marble, even acrylic glass! They have a patented system where the staircase is completely open and appears to hang from the wall. This is unique and allows more light to enter the room making it feel more spacious. They are each custom made within their own system and are competitively priced especially when using their “longlife” treads which are extremely hard wearing and won’t stain or mark. 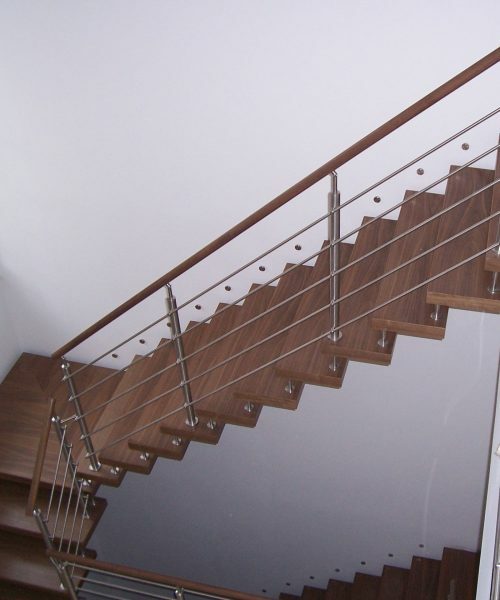 There is a range of balustrade designs also or we can supply and fit our own stainless steel and glass balustrade to these stairs to lower the total cost.